Castle Rock Resort and Waterpark is located in beautiful Branson, Missouri. They offer a 30,000-square-foot indoor waterpark and 10,000-square-foot outdoor waterpark. They also have an on-site restaurant, a 24-hour arcade and gift shop, and day spa & salon. The resort features 98 Tower rooms connected to the Waterpark through interior corridors and 102 exterior entrance rooms in the two Atrium buildings located approximately 50 yards from the Waterpark. Each Tower room has a built in Kiddie Cove (6' x 4') with a bunk bed and 19” flat screen tv. The Tower room accommodations boast 2 double beds or 1 king bed, 32” flat screen tv, mini fridge, coffee maker, iron, ironing board, and hairdryer. The newly refurbished Atrium rooms boast 2 queen beds, or 1 king bed, a 32” flat screen tv, coffee maker, iron, ironing board, and hairdryer. Castle Rock offers one of Branson’s best attractions right on-site with our 30,000-square-foot indoor and 10,000-square-foot outdoor waterpark. 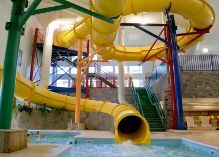 The waterpark features 150,000 gallons of splashtacular fun with two, 500-gallon dumping buckets, multiple indoor and outdoor kiddie pools with rain showers and waterfalls and more! Enjoy a swim in the indoor lap pool or play basketball in the indoor activity pool. Loop and dip through 2 large three-story thrill slides, kick back for a ride on the lazy river, play on themed water slides or relax on the multilevel sun deck.